Old Fashioned Ice Box Cookies…They’re a Cinch! With dough on standby in the ice box, you can make this many in about 10 minutes...gotta love it! Starting to feel that teensy bit of panic set in? Trying NOT to look at the calendar and realize that the holidays start NEXT WEEK? Thinking over all that was on your “To Do” list and is rapidly moving to the “No Way” list? I’m with you. While I have been diligently making things for gifts and yes, buying a few little items as well, I’m beginning to realize that I haven’t really wrapped anything, and that some of those goodies I wanted to make are just too time consuming to contemplate at this juncture. Exit the supposedly “easy” and enter the “effortless”…at least by comparison! This post and my next will feature recipes for some things I made over the last two nights that make terrific quick gifts, good fun and great eating. 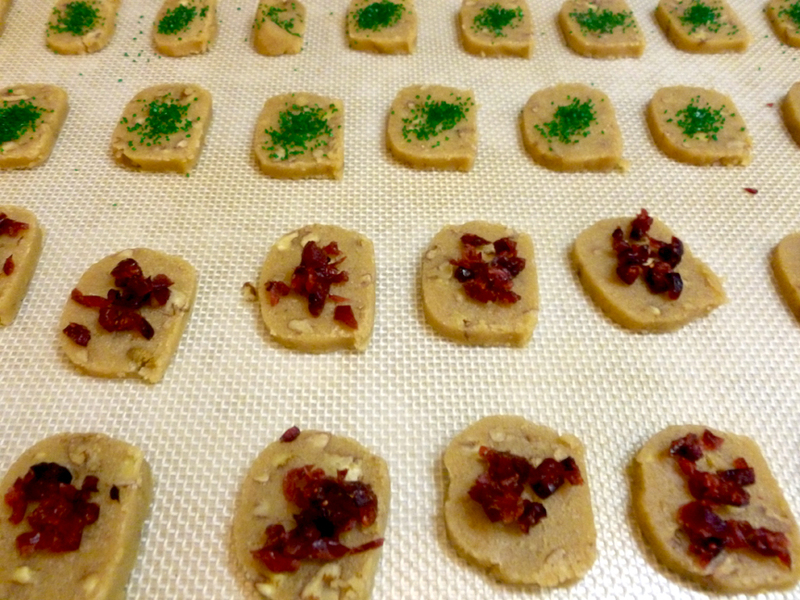 Decorate, I used chopped dried cranberries and sugar, and bake! Today’s recipe is for old fashioned ice box cookies from one of those little regional jewels, the 1972 Decatur Junior Service League’s Cotton Country Cooking Cookbook (this would be Decatur, Alabama, not Decatur, Georgia). My mom gave me this cookbook when I first moved to Atlanta after college (not 1972 BTW), and there are several recipes I use repeatedly from it…this being one of them. If you’ve never made an icebox cookie you really should try these. They are rich little cookies with a butterscotch-like taste to them (I use pecans for the nuts) and the dough can be made ahead and frozen for up to a month, then just pull them out as needed, slice, decorate with fruit or sugars if you like, and bake. I still have 3 logs wrapped and frozen, ready to pull out and make fresh homemade cookies for giving or sharing at a moment’s notice….and needless to say, they are WAY better than most of those you find in your grocers’ fridge case. For gift giving, bag them and tie with decorative raffia or ribbon, or just put them on a pretty plate. Easy peasey. Here’s the exact recipe as it’s printed in the cookbook, along with a fine comment from the woman to whom the recipe is attributed, Mrs. Billy W. Payne. Cream butter and sugars. Add egg and flavoring and mix until well blended. Add sifted dry ingredients and nuts and mix together with hands. Shape into rolls, wrap in waxed paper and refrigerate until ready to bake. Slice thin and bake on greased cookie sheet 8-10 minutes at 350 degrees. Watch closely. Makes about 6 1/2 dozen rich cookies. Freezes well. For an “I don’t know what to do now” day, slice the cookies frozen or refrigerated. Place on greased cookie sheet. Put colored sugars, cut raisins, cinnamon and sugar, etc., in muffin tins and let all the children decorate a pan of cookies. Have broom handy! This entry was posted in Cookbooks, Cookies, Food, Holiday gifts and tagged baking, decatur alabama, Holiday Baking, ice box cookies, old fashioned cookies, quick gifts, quick recipes by bitsandbreadcrumbs. Bookmark the permalink. Looks like a great recipe, Betsy. Thanks for posting it! I think I’ll give them a try. I think you can do just about anything, Cecilia! But these easy cookies might be something good to add to your busy days! I love ice box cookies. Make ’em, roll ’em, and leave ’em in the fridge. When you’re ready, slice a few — or a lot — and bake ’em. You can be serving warm cookies to unexpected guests within 20 minutes of their arrival. That truly is the beauty of the ice box cookie…so convenient and so good. I’d forgotten about this recipe because I hadn’t made them in a few years. Now I feel kinda secure knowing I have something in the fridge! It is a temptation, Julie, that’s for sure! Icebox cookies are indeed an old favourite, Betsey. 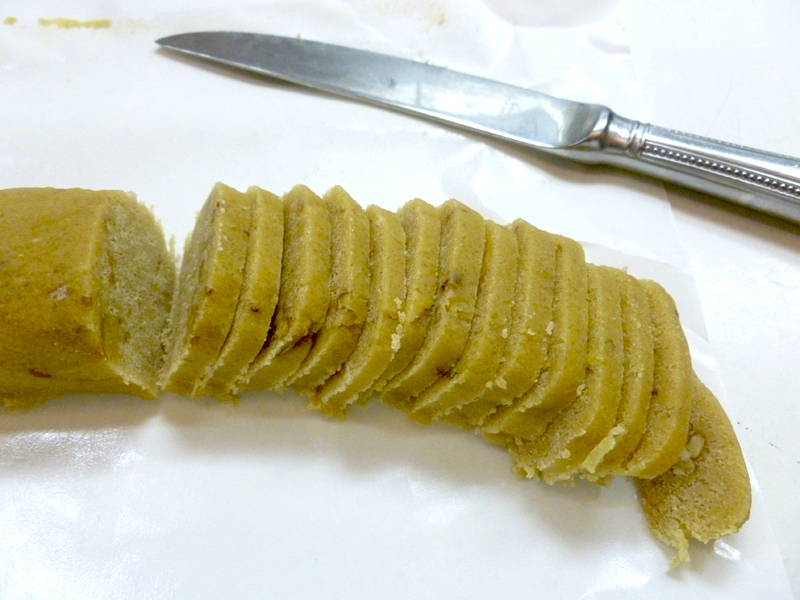 I actually freeze any type of cookie dough that has a good portion of butter in it…the butter makes it easier to cut. I like your festive decorations on them too. I think that’s really a great idea, Eva. The dough does have to have a good bit of butter, but so smart to freeze some for later. My decorations were what I had on hand…but very Christmassy colors for sure! I love having rolls of cookie dough in the freezer as stand bys- it makes life so much easier! it does make life so much easier…and now that I have some in the freezer, I want to expand on my freezer stash! Hi Kay, and thanks so much for stopping by! You are most welcome for the recipe. These are good and rich little morsels, and perfect for last minute somethings to take to a party. They keep a couple of days in an airtight container after being baked, too. Am coming to visit you in just a minute! I haven’t even heard of icebox cookies before! Nice share, thanks! Hi Kim, thanks for visiting! They are an old fashioned, but good and so convenient thing to know about. You should give them a try! Thanks Sharp and thanks for visiting! Great advice and I plan to do just that. I hope you do the same and that your holidays are magical! And again, thank you…I’m excited about the award! Thanks for stopping by my blog and clicking the “like” button. I am looking forward to following your blog and reading all the wonderful recipes. Hi Ruth, and thank you for stopping by and for the nice compliment. I’ve subscribed to your blog can’t wait to read your upcoming posts. Happy New Year to you! Isn’t it funny how these recipes get around? I’m so glad that you’ve found this recipe again and hope that your children and grandchildren enjoy it…and enjoy slicing and baking them with you! Merry Christmas!